Redwood Shores, Calif. – June 16, 2008 – Kensington Computer Products Group, a worldwide leader in delivering smart made simple computing accessories for the mobile consumer, today announced two innovative new wireless mice that help simplify school and business travel whether across the campus or across the globe. The versatile SlimBlade(TM) Bluetooth® Presenter Mouse combines the power of two devices into one, while following the notebook's sleep and wake modes so a user never has to turn it on or off again. The ultra-portable Ci95m Wireless Mouse with Nano Receiver offers instant connectivity, so it's always ready to spring into action. The SlimBlade Bluetooth Presenter Mouse gives students and mobile professionals a compelling reason to jump on the growing Bluetooth bandwagon. People know the Bluetooth technology primarily from their cellular phone experience. But now that more notebooks are equipped with Bluetooth capabilities, Kensington and its smart made simple design philosophy is helping users benefit from that. The sleek SlimBlade Bluetooth Presenter Mouse gives users all the advantage of a full-function laser mouse for the ultimate in precision, responsiveness and tracking ability while saving a precious USB port for other devices. It also saves school and travel bag space by doubling as a meeting or classroom presenter. A simple double-click easily toggles between the two functions. The ultra-portable Ci95m Wireless Mouse with Nano Receiver offers "always on" instant connectivity that users can depend on for maximum working flexibility as they move around campus or around town. The 'plug and stay' nano receiver is so small that it can stay plugged in, so users never need to dig through their bags again, searching for their receiver. Its ultra-thin design, rubberized non-slip grip and 2.4 Ghz frequency make it a rugged and reliable traveling companion. "Many people prefer using a mouse than a notebook touchpad," said Bill Rathbone, Senior Global Product Manager, Kensington, "and our new mice make it easier than ever for them to enjoy the extra comfort whenever they are on the move. Our smart made simple designs provide control, comfort, and peace of mind. They're optimized for the rigors of travel and are always ready to use. The great-looking Ci95 mouse offers the "plug and stay" convenience of a nano receiver at an affordable price. And we're especially proud to offer a Bluetooth mouse and presenter in one. Bluetooth is increasingly popular in notebook computers but few input devices take advantage of it. We have entered this market with a highly flexible, dual purpose device and plan to add even more consumer choices as we go along." 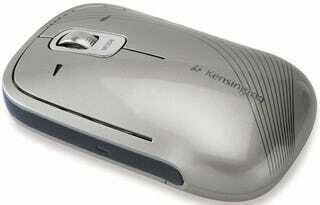 The Kensington SlimBlade Bluetooth Presenter Mouse (SKU K72330US) at a suggested retail price of $59.99 and the Kensington Ci95m Wireless Mouse with Nano Receiver (SKU K72328US) at a suggested retail price of $39.99 are available at Amazon.com, Kensington.com and major retailers. For additional information on the new and existing line of Kensington products, please visit www.kensington.com.